ALDERNEY'S States Works Department and a builder's team have mounted a clean up operation to remove asbestos from the remains of a garage which went up in flames. The blaze broke out at the former Mouriaux Garage, close to the island's water tower at around 4pm on Thursday and it took fire crews six hours to fully extinguish it. The building was being used to store construction materials wood, paint and adhesive and oxy acetylene along with a fork lift truck and another vehicle. The roof of the old garage was lined with an inch of concrete asbestos and there were concerns for nearby residents. Residents within a 400m exclusion zone were evacuated from their homes during the blaze and fire fighters wore masks to protect themselves from breathing in asbestos fibres. A States Works Department spokesperson said they were working quickly to make the area safe. "The asbestos will be taken away, bagged and buried," he said. "We don't want people near it breathing in dust and fibres." Ashley Hope-Smith lives in a house on nearby Carriere Viront and was driving home from collecting his son from school. "We were just driving past the turning to the Mouriaux Garage near where we live in Carriere Viront and there were some guys running over to it and smoke started to come out of the open garage door," he said. "We went and parked the car to get out of the way and I went to see if I could do anything to help and by this time there were flames coming out so we got everyone back and the other residents in the four bungalows down there they came out to see what was going on and they were worried about debris that was going to fall down over the houses. We just watched as it got worse and worse. There were flames leaping out of the front, then the roof and we could hear explosions inside. It's a store for lots of building materials and equipment - lots of wood and possibly paint and adhesives. It was quite spectacular and quite frightening." Alderney's entire fire fighting capability was called out to tackle the blaze -the biggest seen on the island in several years. The call, patched through from Guernsey Fire and Rescue, saw the island's nine retained fire fighters were bleeped to attend the scene and they were soon joined by the airport's complement of full time fire fighters. Early on Alderney Airport had to be closed because of thick black smoke billowing out from the fire across the runway. At its height 15 fire fighters fought to put the flames out with six of the island's fire appliances called into service. They battled for an hour to get the blaze under control. Fire chief Paul Moore said the volunteer crews' regular twice weekly training had paid off. "I think we did well," he said. We managed to get it under control with the assistance of the airport. As soon as the airport was closed they came to help us. "The main problem we had was water. We arrived with 2,000 gallons of water - the maximum our appliances carry. We had to set up a pipe relay from the street hydrant on Les Mouriaux and one from the side of the Island Hall and that took time." The building materials in the garage belonged to contractor Tony Bohan, whose team was renovating the historic nearby Mouriaux House. 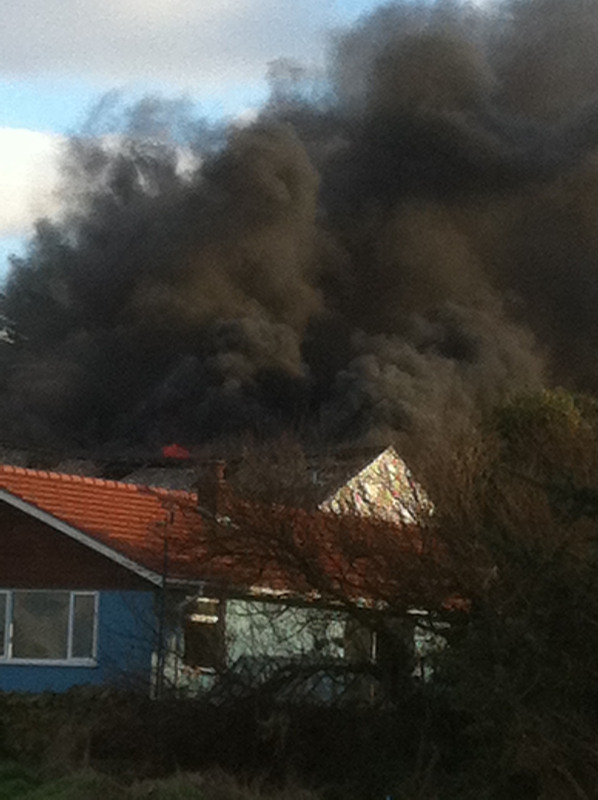 The fire is believed to have been caused by accident as contractors worked in the garage. Insurers were coming over this morning in a bid to find out exactly what happened. No-one was hurt in the fire and police said there were no suspicious circumstances.